Moremi to Savuti Botswana - Road conditions. 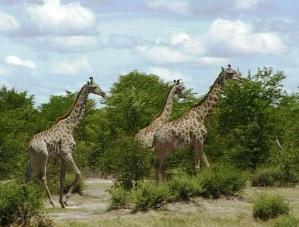 The game parks in Botswana are not fenced, so game can roam freely between Chobe and the Moremi. The area between North Gate, and the Chobe Park Boundary belongs to tour operators with hunting concessions, and game can be frequently seen here. Which means you never leave the wild. 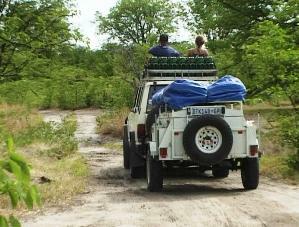 Travelling in an easterly direction alongside the Khwai River for approximately 35 km, one enters Chobe National Park and reach the Maghikwe Sand Ridge. At times it can be difficult to cross the ridge as the sand is very loose. 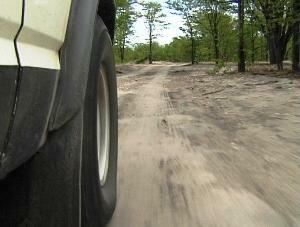 After rain the sand becomes compacted and going is better. The Maghikwe Sand Ridge was once the shoreline of a magnificent inland lake. Across the Ridge the road forks to the left and we will travel for another 15 km on the hard clayish surface of the Mababe Depression until we reach the Mababe gate.